Now that we’ve all had a chance to pick through the entrails of a fairly low-key federal budget, let’s ask the questions: What does it tell us about the next election? How do we place this budget within the evolving political landscape? What does this fiscal plan reveal about broader changes to our society and democracy? Finally, how does this connect to what we believe to be the most fundamental political challenge of our age – the diminution of the middle class and the collapse of the ethic of progress? In a nutshell, Canadians (and Americans) no longer feel that upward mobility is the inevitable reward of effort and skill. There is pervasive sense that stagnation is turning to decline and that the future is very dark for the coming generations. Apart from the glaring disconnect between public outlook on the economy and the cheerful economic narrative of the government, how can this rather unremarkable budget – politically workmanlike yet numbingly banal in terms of economic policy – shed light on these big-picture questions? What do major clawbacks to health coverage for retired public servants and reining in ‘out of control’ sick leave benefits for current public servants really tell us? Beyond outraged public service unions – now unified in an unprecedented common front – who else really cares? Will octogenarian federal pensioners really evoke much sympathy from an inattentive and hunkered-down citizenry? While it may be seen as stretching the evidence, the simple fact is that the agenda of Prime Minister Stephen Harper’s government is no longer about an incremental, gradual shift away from a progressive state to a model of minimal government embodied by neo-conservative Reaganism or Thatcherism. The attendant supply side monetarism and the bumper sticker simplicity of “lower taxes + less government = prosperity for all” has clearly been inspirational to the current government. The public may now see trickle-down economics as a cruel hoax, but it still seems to be the theory informing the current government’s approach to the economy. But is this merely rhetorical flourish, or an abandoned principle for the current government? Also, to what extent is this reworking of the role of the state a reflection of the values and preferences of the citizenry? Stephen Harper has led nothing less than a profound transformation of the federal government. The current size of the federal is now down to 14 per cent of GDP. This is the lowest level seen in over 50 years and the current budget makes it clear that this is a work in progress. As Eugene Lang notes in his recent column in the Toronto Star, that same ratio stands at 19 per cent in the U.S. and 21 per cent in Australia. The drop has been dramatic and coupled with continued emphasis on the importance of fiscal discipline and dealing with government waste. Is this emphasis on ratcheting back the role of the state mirroring shifts in public attitudes? Is it transforming Canadian core values? The chart below shows the positioning of various values and how they have changed over the past 15 years. It suggests Canadians’ values have stayed fairly stable, which should come as no surprise. Source: “Looking Backward, Looking Forward: Part 4”, January 4, 2013. What is notable is that what change has occurred is focused in the realm of small-c conservative values. Ironically, as our government has shifted right, the public have shifted away from conservative values. This is especially true of younger Canadians – a fact that goes a long way in explaining the paradox of a government and an electorate going in different directions. Let’s consider one specific value – ‘statism’, a term coined by Seymour Martin Lipset to describe what he saw as one of the most important and enduring value differences between Canadians and Americans. Minimal government – clearly favoured by the Conservative party – is at the bottom of the tested values list. And the meagre emphasis on “minimal government” as a core value has declined further over the past 15 years. In Europe and the United Kingdom, commentators have noted that while the younger generation is the most socially progressive, it is less collectivist and statist. It would appear this trend is not occurring here in Canada, where younger citizens are much more likely to rate minimal government lower today than in 1998 (those the under the age of 25 give “minimal government intrusions” a mean rating of 42, compared to 62 in 1998). 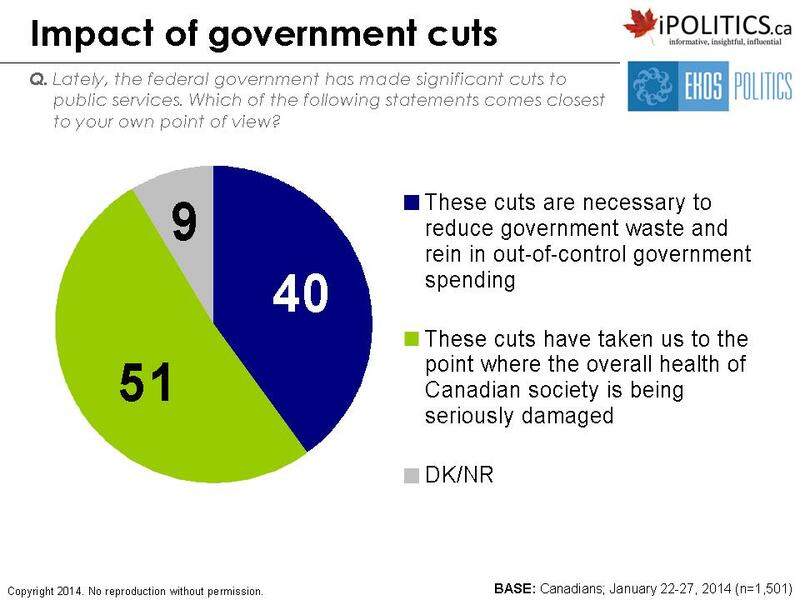 At 42 on a scale to 100, this means that the value of minimal government has virtually no relevance to younger Canada. The only place it continues to resonate is in older, conservative Canada and the Langevin building. We updated our tracking on whether Canadians would prefer a larger government with higher taxes and more services or a smaller government with lower taxes and fewer services. The chart below shows an important trend line. Many have claimed that the recent political success of the right reveals a “blueing” of Canadian attitudes. 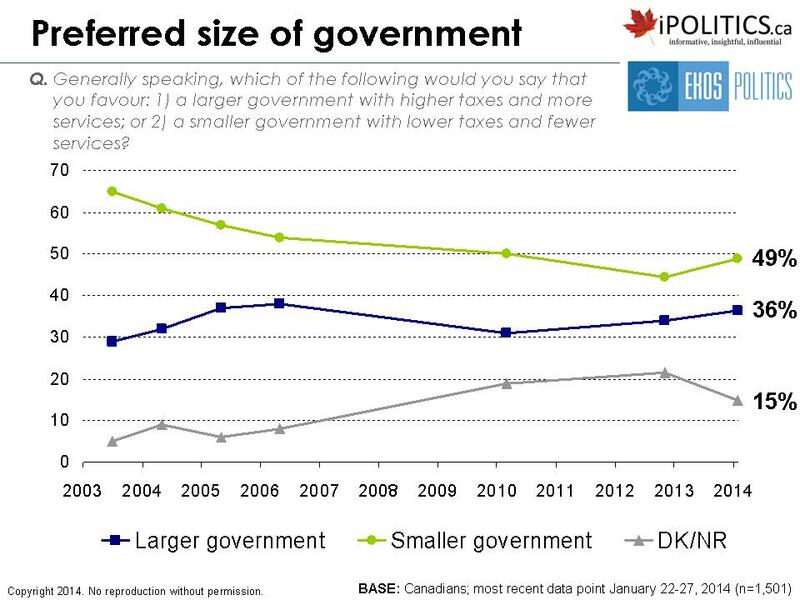 The time series data, however, continue to show that Canadians are less likely to prefer smaller government than they were in the past. They still want government to play a positive role – not to retract, but to cost less. This probably reflects the continuing belief that government is wasteful rather than any new belief that government is less important. Not surprisingly, ideology matters here. And attitudes seem to be polarizing. As we would expect, self-declared conservatives are more supportive of cuts to taxes and government than liberals. 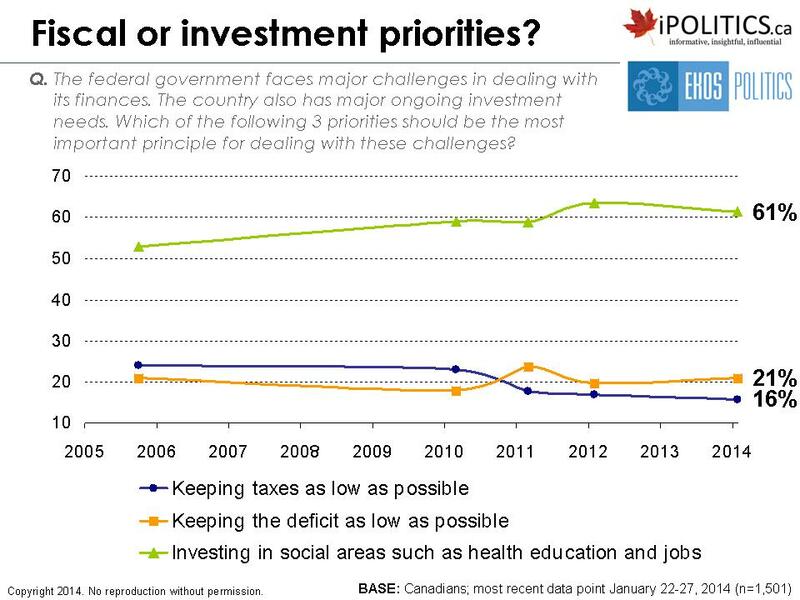 However, there is no evidence of a fundamental shift in Canadian attitudes on the importance of government. We also find significant variations in attitudes to taxation and role of government depending on age, gender and, to a lesser extent, region and locale. By far the biggest effects are linked to political ideology and party choice. These differences become clearest when we are talking about the issue of taxation as it connects to the size and role of the state. Conservatives clearly lean towards smaller government; support for reducing government is twice as high among them as it is among NDP and Liberal supporters. This parallels similar if even deeper difference in the United States where the mantra for the Republicans and the Tea Party movement in particular is summed up with bumper sticker simplicity: “Less taxes, smaller government”. Let’s consider another look at the question of smaller government versus more investment. Here we see a very different result but the same trend line with favour for smaller government falling somewhat (which mirrors the pattern on the last indicator and the values change test). Once again, we see a very large gap between support for tax relief and lower deficit versus support for social investment. The concentration of support for smaller government among the unified Conservative base seems to at least electorally offset the greater support for a more active state and the trend lines showing increasing resistance to the lower government/less taxes prescription for economic and societal well being. One of the most important sources of fuelling the balanced budget and imminent election year surplus is claw-backs to publics servants both current and former. Whatever the fairness of this sort of targeting, it may well be politically effective since there is not a lot of sympathy for “poor” public servants. In fact, of all of the areas that the government can put central in the next campaign, this may be the one where they have the highest ground, particularly with their available constituency. This political advantage may, however, become less apparent when arrayed against broader issues of trust and the debate about the role of government in the future. We know that trust in government has declined dramatically over the past several years but do the public differentiate their trust in politicians and public servants? The figure above shows that they do indeed make dramatic differentiation. 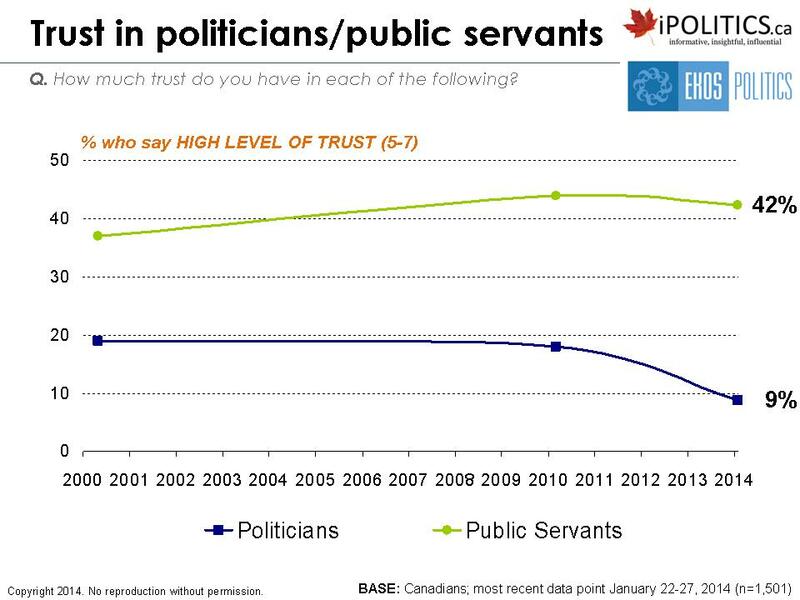 While trust in public servants is only moderately positive, trust in politicians is virtually extinct. In our most recent poll, trust in politicians has dropped into single digits for the first time. It is interesting to see that despite the tepid enthusiasm for the plight of public servants, there are some interesting areas of push-back that do not seem to be about simple self-interest. 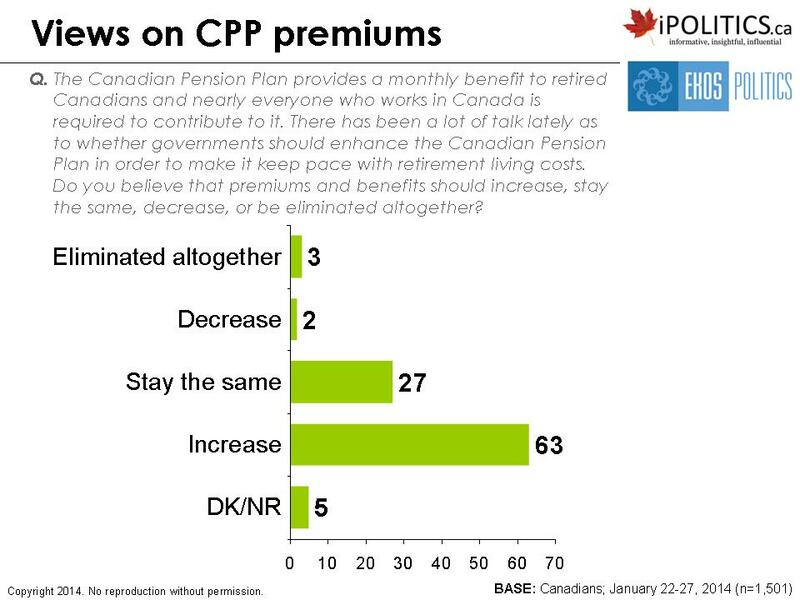 As the chart below shows, the number of Canadians who think the federal government’s priority should be improving pension benefits for everyone is more than double the number who want public service pensions clawed back. Noting the generalized anxiety about a darkening economic future, it is also instructive to compare the government’s position on the more basic question of the Canadian Pension Plan (CPP). Many – including the Government of Ontario – have called for increases to CPP premiums to forestall against an affordability crisis for Canada’s rapidly aging workforce. The ruling Conservatives have staked out the austerity position arguing for holding premiums constant. Although about a quarter support this position, this minority is dwarfed by the large majority who favour increases to the plan. Once again, we see the familiar divide over whether government should be taking a larger or smaller role in economic and social investment – reflected in sharp differences among Conservative supporters and everyone else. We see a similar divide on the question of whether recent efforts at austerity are necessary or damaging. While a slight majority are offside with the austerity position, the 40 points lined up with the government look really attractive compared to their current position in the polls. The austerity position is favoured by the majority of the Conservatives’ available constituency and ‘stop the gravy train’ politics remains a powerful hook for candidates on the right. At a time when the government’s cheerful economic narrative is ringing hollow with most Canadians, a campaign focused on the bogeyman of federal waste and abuse seems more plausible. Virtually everyone agrees that a top priority for the country is to kick-start a moribund middle class. This will be a defining issue for the 41st election and the area where there will be vivid differences across the offering of the different parties. We believe that the issue of the role of the federal government in planning and delivering solutions and buffers to middle class angst will determine be critical to sorting out the eventual winner. Beyond the consensus that we need a new blueprint, there is considerable disagreement about what that plan should look like and who should shape and execute it. We can see that most Canadians favour a number of authors with government leading the attack. It is notable that experts and evidence are seen as critical as well (not a central belief of the current government). Average citizens also seen as important for a citizenry frustrated with the apparent failure of other actors to solve this problem in the public interest. The private sector is also seen as having a significant role to play with unions and the not-for-profit sector also as part of the mix (albeit in a much less prominent way). Of course, how you see that labour being divided depends very much on which party you support. 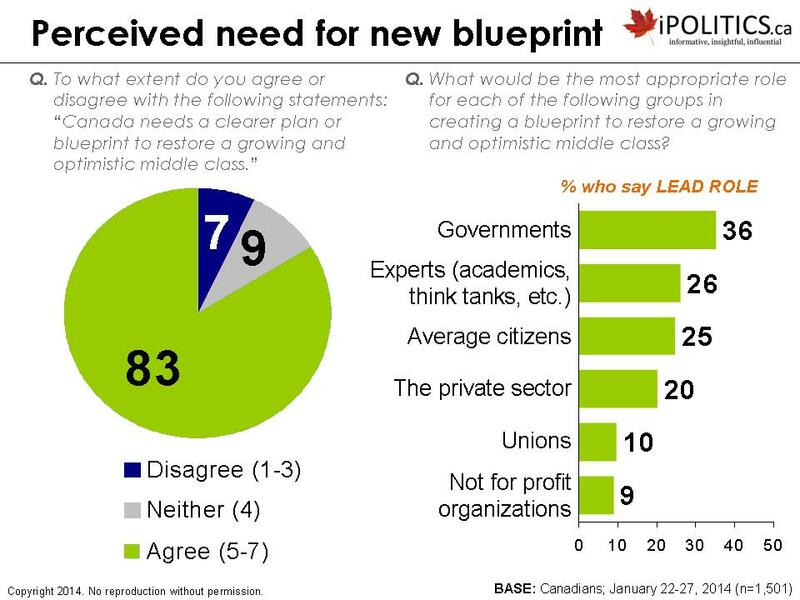 Conservatives see the private sector as best-equipped to lead the blueprint. Supporters of other parties want to see government in the driver’s seat. 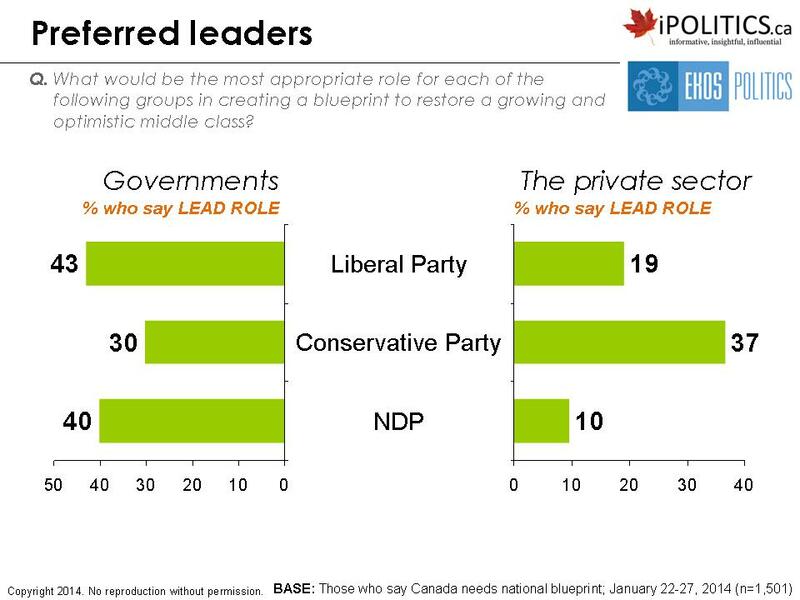 For Liberal supporters, government is the clear choice to lead – even more so than among NDP supporters. NDP supporters see a relatively trivial role for the private sector, while the Liberals see the private sector having a much more important – albeit subordinate – role. This hints broadly at potentially vivid different approaches across the three main contenders for power in an election that will be all about saving the middle class and at the same time all about the role (or non-role) of the federal state in producing middle class renewal. The degree to which Government is an interference in your current life in your current country determines the degree to which you find smaller government important. Several polls in the ‘States where the Feds have become massively intrusive, the desire for bigger government has been turned on its head. The direct beneficiaries of government largesse – food stamps and social assistant recipients are all for big government, but the backlash against big Government starting from the days when Obama’s stamp was beginning to be felt, has ratcheted up. I have seen polls range from 60% to 75% in favor of SHRINKING Government in the US, because the know what big Government looks like, and they don’t like it. The same would be true here in Canada in my opinion. But government is bigger in Canada than in the United States, despite Harper’s recent efforts at shrinking the federal government.